More new aircraft arrived at the airfield during the 70s for testing though many of these programmes now had an international aspect being either sourced from the US or developed in partnership with other European countries. Therefore, although the intensity of work remained high, the scope of testing at Boscombe Down varied depending on the programme with numerous trips to other locations. Aircraft such as the Jaguar, Puma and Gazelle were tested with France, the Tornado with Germany and Italy and others such as the Phantom and Hercules drew on US development activities. There were still a number of British designs such as the Harrier, Westland Lynx and Hawk being flown but no more maiden flights took place. However, an interesting post script is that the first and only prototype Hawk which first flew in 1974 at Dunsfold remains in service to day with ETPS, a very unusual occurrence in the world of aviation. In 1971 50 years of the Aeroplane and Armament Experimental Establishment was celebrated with a Royal Visit and presentation of Armorial Bearings. Originally it was to be Her Majesty the Queen but in the event Princess Anne represented the Queen. Unfortunately it was raining on the day in March but major displays of the establishment’s work were set up together with aircraft from the past such as the Supermarine S6B. An unusual exhibit in the form of a glass lantern containing aircraft models and the coat of arms exists outside Bldg 456 to commemorate the occasion. The coat of arms contains references to the County of Wiltshire, Martlet birds (c.f. Martlesham Heath), a glove and gauntlet together with a Great Bustard. The motto is ‘Probe Probare’ translated as ‘Properly to Test’. 1972 saw the completion of another specialist facility, RADEX, the radio trials facility on the far south of the airfield. This brought together specialist communications testing capabilities at a single location. Other 1970’s developments were less visible and centred around the increasing use of computers to analyse and gather data together with improvements in telemetry. The only exception being that in 1975 the ETPS Lightning T4 made it last flight and was subsequently installed as a gate guardian outside the Sgt’s mess. 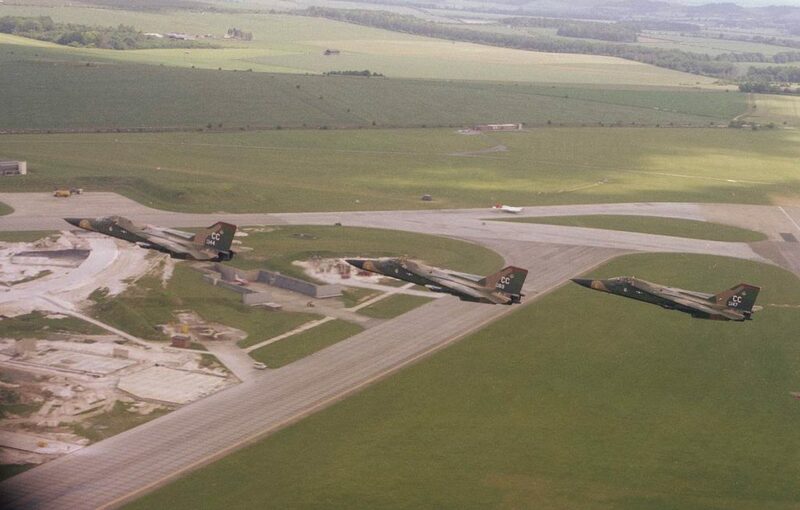 Early in the 1980s Boscombe Down was chosen became one of the Contingency Operating Bases for the United States Airforce. This decision resulted in the next major change to the airfield with the massive building programme of Hardened Aircraft Shelters (HAS), new taxiways and the supporting concrete operations structures. The HAS’s and other buildings stand today as reminder of the Cold War tensions that existed at that time. The USAF used the facilities on three occasions when F-111 aircraft were operated on exercise with the shelters and hardened operations facilities put to use as designed. There was a plan to build further HAS’s but these were no longer required. At a similar time the old High Post hangars took on a new lease of life as the home to the new Tornado Operational Evaluation Unit (OEU) and subsequently the Strike Attack OEU. A new building was also contracted to house the Tornado Software team. Aside from testing more new types such as the Tucano and Tristar, the Falklands conflict in 1982 resulted in an intense amount of flying activity, much of which centred around providing additional air to air refuelling capability for a number of aircraft such as the Hercules. Many of these developments that had been rushed into service for the Falklands were then brought into core UK capability and this requirement drove a wide range of programmes such as the AEW Sea King in the following years. On a more relaxed note 1986 saw the airfield featured on the BBC with the first TV programme covering ETPS (a subsequent film was made in the late 90’s).